Sweetfern. Comptonia peregrina (L.) Coulter. Comptonia asplenifolia Gaertn. ; Myrica asplenifolia L.
Ferngale, fern bush, meadow fern, shrubby fern, Canada sweetgale, spleenwort bush, sweet bush, sweet ferry. 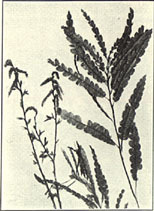 Sweetfern is usually found on hillsides, in dry soil, from Canada to North Carolina and west to Indiana and Saskatchewan. Sweetfern is a shrub from 1 to 3 feet high with slender, erect, or spreading branches and reddish-brown bark. The thin, narrow leaves are from 3 to 6 inches long, from one-fourth to one-half an inch wide, deeply divided into many lobes and in general resembling the leaves of a fern. Both male and female flowers are produced. The former are borne in cylindrical catkins in clusters at the ends of the branches and the latter in egg-shaped catkins. The whole plant has a spicy, aromatic odor, which is more pronounced when the leaves are bruised. The entire plant, especially the leaves and tops. prev: Sweet Cudweed. Gnaphalium obtusifolium L.
next: Sweetflag. Acorus calamus L.